It was my friend J's birthday on Monday and for a while now I seem to have been established in the role of the birthday cake baker at work. So of course I baked a cake for J. I wanted to try something different and new, which can be a bit risky if you're baking for somebody else, especially for somebody who loves baking themselves, and who is very good at it. I didn't let that put me off though. 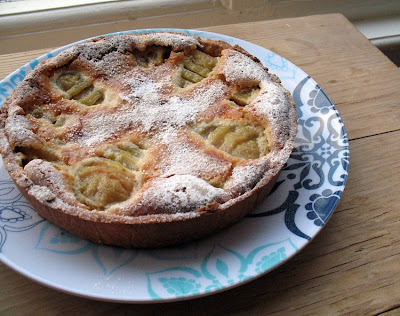 Trawling my cookbooks and the web for inspiration I came across Dorie Greenspan's recipe for French Pear and Almond Tart, which had gotten rave reviews from all the Tuesday with Dorie Bakers, so I figured that I couldn't really go wrong with it. I didn't (go wrong with it, that is). 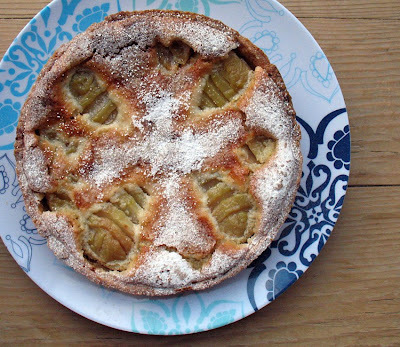 I like pears and I like almonds and as far as I knew so did J., so combining them in a tart seemed like a clever idea. The result was really good. Sweet but not overly so. Moist from the frangipane filling. Crumbly around the outside, because of the rich buttery pastry. But why don't you try it for yourself. You can find the recipe here. that looks blooming delicious! will definitely try the recipe - when my oven's finally fixed! Oooh, lovely. Stephen ordered this in a restaurant recently and I loved it. I've been wanting a slice of my own ever since. ooooooh..... your pie is sooooo pretty!! That pear tart looks great! I like the slice pears that can be seen on top. Love the look of that tart Sylvie! That looks really delicious, save me a slice! Lennie, I hope you'll get your oven fixed soon. It's such a pain to have appliances that don't work. Ginger, now you can have a slice whenever you feel like it. Trish, Gloria, Kevin and Jan, thanks for the lovely comments. David, thanks for pointing that out. It's so easy to overlook silly mistakes like that. Anna, I would save you a slice, but I'm afraid there were none left to save. this is luscious! bravo! a fine birthday treat. Sylvie that tart looks so good! I'm going to save the recipe as Craig has such a sweet tooth he would love it. That looks fantastic, I'm it tasted it too! That's a great looking tart Sylvie! Your tart looks delicious Sylvie and has me wanting to bake this tart again! Sylvie, you make this kind of stuff for coffee & tea wonderfully. Anyone would feel at home being served this. This is just my type of tart Sylvie. Pears and almonds are a wonderful combo. That looks delicious. I love almond tarts and they go with so many different fruits. Pear is a lovely one!